(4) She helps each afternoon during car duty no matter the weather, walking and calling names of students and making dismissal run smoothly. 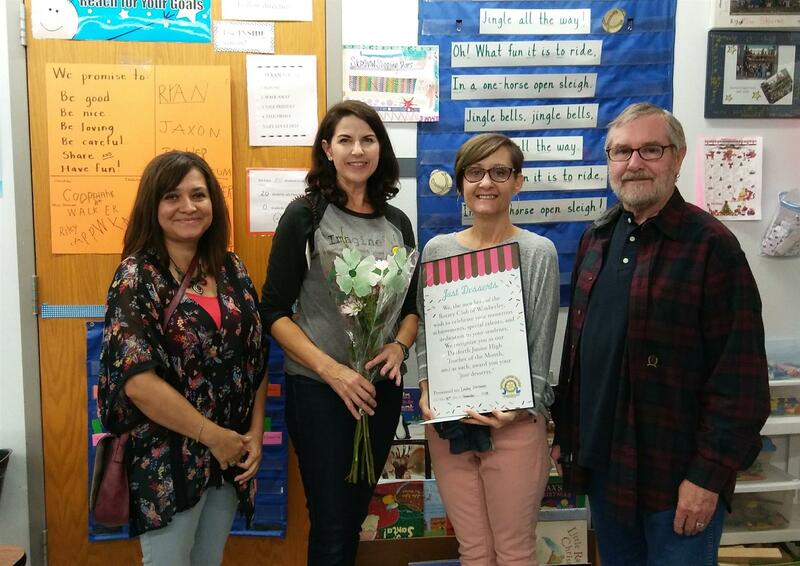 On November 30th, local Rotarians presented Mrs. Skrovan with her "just desserts" which included a chocolate cake, a framed certificate of appreciation, flowers and a Rotary Loves Readers t-shirt. "Just Desserts" is a teacher appreciation activity organized by The Rotary Club of Wimberley. "Just Desserts" is the most recent addition to the Club’s series of programs under the theme of "Rotary Loves Readers." These programs include reading initiatives within our schools, library seminars, a nursing home book club, book giveaways, and scholarships. Rotarians are also “Reading Buddies” for 25 current Jacobs Well Elementary 2nd graders who need a little extra practice reading.